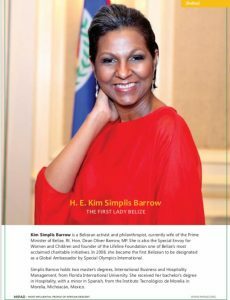 Kim Simplis Barrow is a Belizean activist and philanthropist, currently the first lady and wife of the Prime Minister of Belize, Rt. Hon. Dean Oliver Barrow, MP. 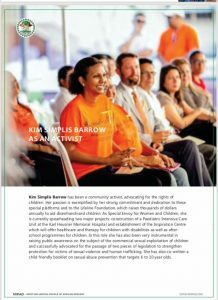 She is also the Special Envoy for Women and Children and founder of the Lifeline Foundation one of Belize’s most acclaimed charitable initiatives. In 2008, she became the first Belizean to be designated as a Global Ambassador by Special Olympics International. Simplis Barrow holds two master’s degrees, International Business, and Hospitality Management, from Florida International University. She received her bachelor’s degree in Hospitality, with a minor in Spanish, from the Instituto Tecnológico de Morelia in Morelia, Michoacán, Mexico. Her caregiving attribute led her to establish The Lifeline Foundation that started in 2005 and registered as a charitable foundation and NGO in 2006 in Belize. Its objectives are to assist generally with the welfare of children in Belize. It raises tens of thousands of dollars annually to aid disenfranchised children. The primary focus of the foundation has been on children living with HIV/AIDS, support to children outside of familial care settings and nutrition programs for children. Mrs. Simplis Barrow has been a community activist, advocating for the rights of children. 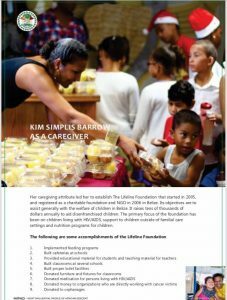 Her passion is exemplified by her strong commitment and dedication to these special platforms and to the Lifeline Foundation, which raises thousands of dollars annually to aid disenfranchised children. As Special Envoy for Women and Children, she is currently spearheading two major projects: construction of a Paediatric Intensive Care Unit at the Karl Heusner Memorial Hospital and the establishment of the Inspiration Centre which will offer healthcare and therapy for children with disabilities as well as after-school programmes for children. In this role, she has also been very instrumental in raising public awareness on the subject of the commercial sexual exploitation of children and successfully advocated for the passage of two pieces of legislation to strengthen protection for victims of sexual violence and human trafficking. She has also co-written a child-friendly booklet on sexual abuse prevention that targets 6 to 10-year-olds.